This site is new, consistently being improved, and looking for input as well as collaborators. It will eventually be hosted. Consider this a "Wikipedia" of TJ football history. 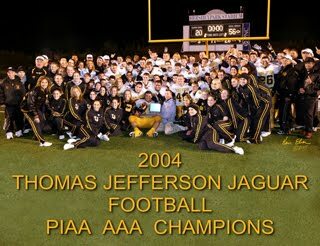 The website is designed to follow the rich history of Thomas Jefferson Football through the eyes of former players, alumni, parents, and coaches. Every year the Jaguars have laced em' up on the gridiron each season's team had its own unique story, and there is no better way to tell the story than through the eyes of those who participated. Revisit the years, the memories thereof, and feel free to share comments. For those with dusty videos and scrapbooks please share articles, comments, stories, links, pictures, video, or audio by emailing them to thomasjeffersonhistory@gmail.com. Thomas Jefferson High School is situated proudly on a hill in the West Jefferson Hills School District, serving the communities of West Elizabeth, Pleasant Hills Borough and Jefferson Borough. Located in the Southwestern County of Allegheny in the Commonwealth of Pennsylvania, it is a Southern suburb of Pittsburgh, PA. The school was established in the early 1950’s as a Junior High School. Grades 10 through 12 were served by Clairton High School in the nearby steel town of Clairton, PA for many years. Most members of the first graduating class had attended Clairton High School and then transferred to the new Thomas Jefferson Senior High in their junior year. In 1958 the extension of the Thomas Jefferson buildings were completed, making it a junior and senior high school. There was no senior class in 1959, the first year of operations. The first class to graduate from Thomas Jefferson High School was the Class of 1960. The Jaguars have accumulated 23 Conference Championships, 7 W.P.I.A.L. Championships, and 3 State Championships during their 57 years of football excellence. The Jaguars have had 8 head coaches. As of the 2016 season, TJ's overall record is 436-195-7 (68.9 % win percentage). Thank you Ken Eber Photography for Sharing!